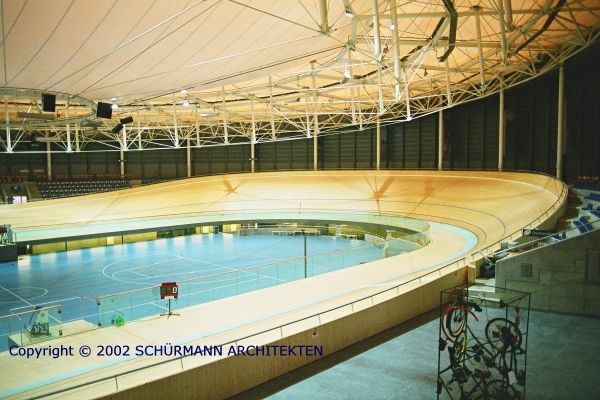 This Cycling Centre must certainly be considered as one of the most ideal and innovative centres for Track Cycling, which have been built so far. "Such a training centre each country should have". 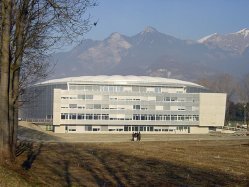 The CMC is located next to the UCI-headquarters in Aigle / Switzerland, a small city, not far from Montreux at the Lake Geneva in Switzerland, in the heart of Europe. On the border of the 21st century the creation of an optimal infrastructure became indispensable in the development of programmes for the entity of the members of the family of cycling, making a special effort for the young ones. in a very variable geographic environment, where plains and high mountains are united within a radius of 30 kilomters. 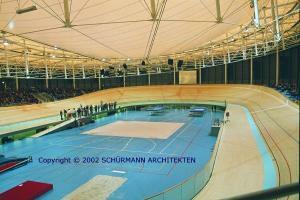 which can permenantly be practised thanks to it's indoor velodrome and it's infield adapted to the needs. The complete venue is being stimulated by specialists, trainers and professional teachers, who are engaged by the UCI and assisted -after needs- by selected specialised personnel. And this thanks to the versatility of the infrastructure of this centre. The track design is -again- a unique and individual design for exactly this intended purpose. Since the track is intended to be a training venue for young riders from all around the world, but -on the other hand- must also be safe and competitive for other events, we have choosen a rather "round" shape, not favouring any special discipline. Nevertheless the straights had to be sufficiently long to enable tight sprint finishes. Therefore our choice was an overall design proportion of LQ=2.22, which puts the track in the top class of multiple-purpose tracks like Berlin/GER, Barcelona/SPA or Minneapolis/USA. Specially for this track we have yet refined our calculation methods by additional programm options, which has lead to our most modern design for such kind of track. The fast times, which have already been achieved on this track, confirm the concept. The track is with 6,65 m unusually broad in terms of a 200 m track. The background for this was again the training issue and the desire to have more space available to training with bigger groups. Usually such tracks would be 5-6 m wide. 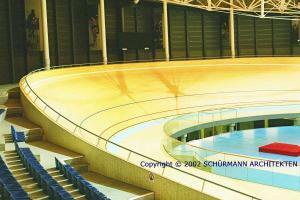 The whole track area is an integral design, consisting of the track itself, the blue-band and the safety zone. All parts are manufactured from wood, which presents a track image, which is unique and very plesant for the riders. Finally this is a result from the very good experiences with the World-Championship-Track in Hamar/Norway, where we tried such a design for the first time. The atmosphere of the Hamar track was praised by many participants and we all saw four fabulous World-Records there. A new feature was favoured by the UCI itself, which showed a very good result. 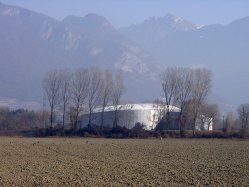 In Aigle the inside fence of the safety-zone is executed from security glass. Although a rather expensive solution (against nets) the impression in the building is stunning and very modern. We expect this solution to become the state-of-the-art for all tracks with sunken infields. 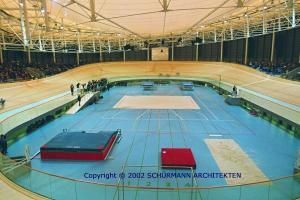 The track construction itself is completely from wood with a surface from specially selected pine-wood from Siberia. The surface with some 1'700 squaremeters is handfinished, smooth and very fast. 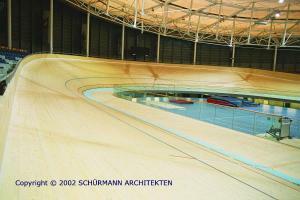 TRACK ARCHITECT: Ralph Schürmann, Architect, Dipl.Eng. For more information about us and our work, please check also our home page.